From the New York Times best-selling author of Before I Go to Sleep, a sensational new psychological thriller about a woman with a secret identity that threatens to destroy her. 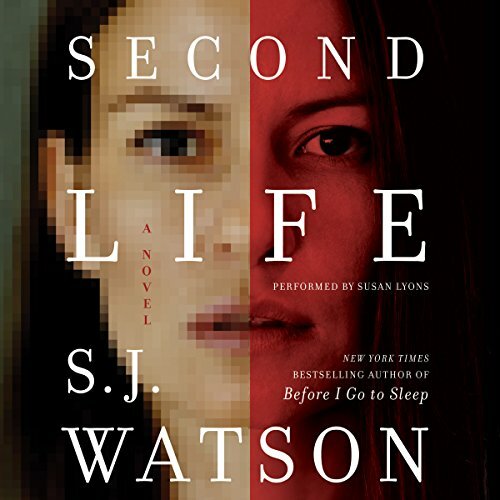 A tense and unrelenting novel that explores the secret lives people lead - and the dark places in which they can find themselves - Second Life is a masterwork of suspense from the acclaimed S. J. Watson. I'm so disappointed in this book. I enjoyed Before I Go to Sleep, but this book is sort of the same except that the main character, instead of making stupid decisions because she's brain-damaged, makes stupid decisions because she's stupid. She doesn't do a single thing right no matter how many chances she gets, and she seems not understand very basic things about cell phones and social media even though she's only in her 30's. It really surprised me. I read an interview with Val McDermid in which she said that SJ Watson was a fresh new voice, but nothing about this book was fresh or new. If you're new to crime fiction, you might enjoy this book because you won't have heard it all before. But if you've been reading books like this for a while now, don't bother. You'll feel like an idiot if you stick around waiting for the plot to twist. Found the main character infuriating. Her bad decision after bad decision were so frustrating to listen to. Would not recommend. I'm going to keep this short the book was awful, the performance was even worse! I got a refund on the book that's how bad it was!! Would you try another book from S. J. Watson and/or Susan Lyons? Not if the main character is as dimwitted as this one! She was so irritating- it made the story completely unbelievable. Would you ever listen to anything by S. J. Watson again? What aspect of Susan Lyons’s performance would you have changed? I enjoyed Susan Lyons narration of Me Before You. I don't think anything could have helped this story. What character would you cut from Second Life? Julia, the central character is a tiresome self dramatising hysteric. I wound up disliking her more than the villian of the book. A totally predictable story. Not unique. Believable, well written, well read. Strong character development along with a compelling storyline makes for a great book! Definitely not. This was the most unsatisfying novel I have finished in a long time. The author didn't take any time to really develop the characters. The main character is completely helpless, unlikable and unrelatable. The end seemed like a lazy cop-out. Perhaps. I disliked the novel so much that it's hard for me to say whether the narration was good. If you could play editor, what scene or scenes would you have cut from Second Life? I thought the main character was so ridiculous and the story so flat, that I don't think any editing could save it. The main character was frustrating! Intriguing story, and pretty good characters, all except for the main character. At first I was going to give this 3 stars as a so-so story -- a protagonist who is self absorbed, often stupid, incapable with technology, and incapable of making good choices. Very maddening. However, herein lies the brilliance of the story. The author takes us into the mind of an addictive personality and lets the story unfold there. We are trapped like the protagonist in a mind that does not engage the world completely but is always wrestling with compulsions and uncontrolled desires. Very well done and a very good performance.